Michele G. Wheatly, vice chancellor and provost at Syracuse University, today announced the appointment of Zhanjiang “John” Liu to serve as the University’s vice president for research. Liu’s appointment, which was unanimously approved by the Executive Committee of the Board of Trustees, is effective on Sept. 1. 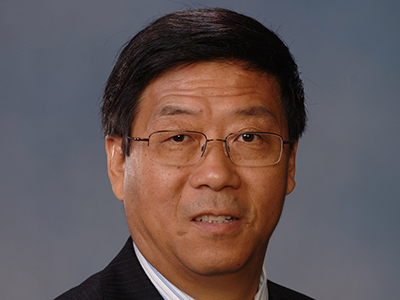 Liu comes to Syracuse from Auburn University, where he has served as associate provost and associate vice president for research since 2013 and as a member of the faculty in the School of Fisheries, Aquaculture and Aquatic Sciences since 1995. “John is an outstanding choice to lead the research enterprise here at Syracuse University,” says Provost Wheatly. “He has excelled both as a scholar himself and as a leader among, and advocate for, his scholarly peers. He has a deep understanding of the value of research in a university setting as well as the increasingly competitive nature of funding opportunities for such scholarship. I am confident he will be an outstanding asset as we build on our Carnegie ranking as an R1 research school and further distinguish Syracuse as a world-class research university. As vice president for research, Liu will report directly to Provost Wheatly and will oversee the Office of Research and its component units: the Office of Sponsored Programs, the Office of Research Integrity and Protections, and the Office of Technology Transfer. Liu will serve as a vital member of the University’s leadership team, working to promote and elevate research activity and partnerships across departments, disciplines, schools, and colleges. He will partner with University leaders and faculty to create and implement an expansive new vision for research activity at Syracuse that enhances its standing as an innovation leader and generates new opportunities for student engagement in scholarship. He also will work to promote translational research and discoveries as well as inventions development and their path to implementation. 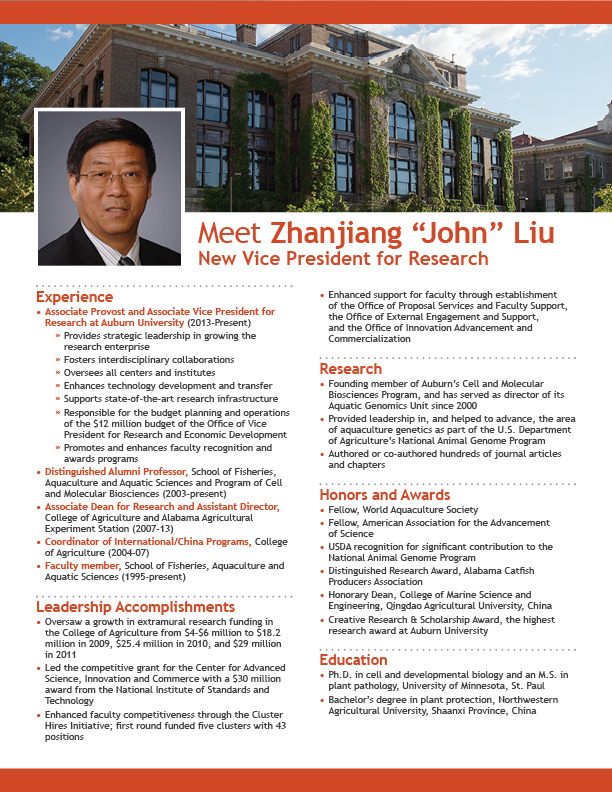 In his current capacity as associate provost and associate vice president for research at Auburn University, Liu has played a key leadership role in growing the research enterprise, fostering interdisciplinary collaborations, overseeing all centers and institutes, enhancing technology development and transfer, and supporting a state-of-the-art research infrastructure, among other achievements. Previously, he served from 2007 to 2013 as associate dean for research and assistant director at Auburn’s College of Agriculture and Alabama Agricultural Experiment Station. During his tenure in this capacity, he oversaw a growth in extramural research funding from $4-$6 million to $18.2 million in 2009, $25.4 million in 2010, and $29 million in 2011. He helped diversify and expand college funding sources, promoted public-private partnerships, and sponsored grants training for junior faculty. A native of China, Liu also served from 2004 to 2007 as International/China Programs coordinator for Auburn’s College of Agriculture. In that role, he helped facilitate international collaborative relationships and cooperative agreements and coordinate various academic exchange programs and outreach activities. Liu was a founding member of Auburn’s Cell and Molecular Biosciences Program and has served as director of its Aquatic Genomics Unit since 2000. During this same period, he provided leadership in, and helped to advance, the area of aquaculture genetics as part of the U.S. Department of Agriculture’s National Animal Genome Program. He is currently serving on a panel for USDA in developing the blueprint for the national animal genomics, genetics, and breeding programs for the next 10 years. Liu earned a Ph.D. in cell and developmental biology and an M.S. in plant pathology from the University of Minnesota, St. Paul; and a bachelor’s degree in plant protection from Northwestern Agricultural University, Shaanxi Province, China. He was elected as an AAAS Fellow in 2007, and a fellow of the World Aquaculture Society in 2017. Wheatly also expressed gratitude to Peter Vanable, associate provost for graduate studies and dean of the Graduate School, who has served as vice president for research in an interim capacity since the retirement of Gina Lee-Glauser from the University in late 2015. “Peter has really done heroic service juggling his multiple portfolios during this transition period, and I know he will continue to be a valuable resource in further advancing our research profile,” Wheatly says.